Are you looking for a way to get involved in local politics? Do you want to give back to your community? 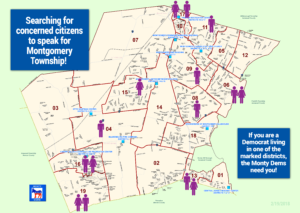 The MDO is looking for community members to be appointed as Montgomery District Representatives. We have several vacancies on our committee, which is in place until the primary election of 2018. Please review this voting district map. If you live in a voting district with an empty seat, as indicated by a purple male or female icon, we’d love to have you join us! Please reach out to chair@montgomerydemsnj.org for more information. Thank you! Somerset County has 21 Municipal Committees, one for each town. A municipal committee person is also a county committee person. (In Somerset County the County Committee reorganizes every two years.). There are two committee representatives per municipal district, one male and one female. How are District Representatives elected? 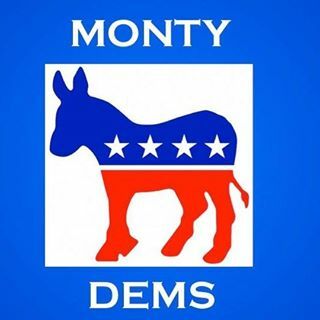 The committee people must fill out a petition and submit it to the township clerk to get their name on the primary ballot so they can be voted upon by the voters of the Democratic Party of that district in the June primary. If a vacancy exists prior to the primary election a committee person may be appointed by the municipal committee Chair and serves until the next primary. The municipal committee organizes on the Monday following the primary election. On that date, they elect a municipal chairperson and vice-chairperson. What are the responsibilities of a Montgomery District Representative?